The most common reasons for evicting a tenant are nonpayment of rent and breaking a rule in the lease. A tenant pays rent two days late. The landlord is fed up, so they reject the check and serve an eviction notice. The problem is that the lease provides for a five-day grace period before rent is deemed late. The tenant was not in default. If this case goes to court, the landlord may be viewed as the one who broke the lease. Can You Prove the Tenant’s Violation? The landlord has the burden of proving the tenant is in violation of the lease, or the law. In most cases, that can be accomplished only through documentation. That evidence should be contemporaneous, and must be detailed enough that the judge won’t question the landlord’s practices — or credibility. When defending an eviction, tenants often throw in the kitchen sink. They may complain about the condition of the property, accuse the landlord of stealing their money, violating their privacy, or a myriad of other reasons to justify their own bad behavior. That’s why it’s so important for the landlord to appear credible, professional, and well-organized. Being able to present a tenant file that shows no complaints or repair requests, or a clean move-in inspection statement that the tenant signed off on will go a long way in muting any frivolous claims a tenant may concoct. That said, be sure you don’t go to the other extreme, and develop an inch-thick dossier on an individual tenant. If you are recording that person’s daily activities and movements like a private detective, it can appear as though you have it in for that tenant, which could be viewed as harassment or discrimination. Keep it unemotional and professional. Before you commit to filing the eviction, get a sense of the current backlog of cases. 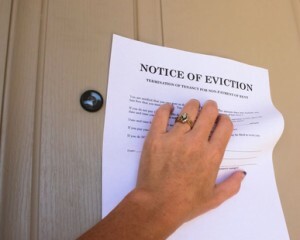 If you are looking at weeks of delay before you can get into court or have the eviction order served, that can be cause for concern because your now disgruntled tenant is still living inside your property. The longer the eviction process takes, the higher the likelihood that you’ll recover the unit damaged. If you are looking at a clogged court docket, or the sheriff’s office is backed up on evictions, discuss settlement options with your attorney. Some landlords have opted to waive early termination fees, return deposits, or even pay a small sum of money to get a risky tenant out of the property. While that seems counterintuitive, it could be the least expensive option for getting the rental property back in service, and that makes good business sense.